Industry specific functionality of VISI Progress module provides a more productive and efficient design experience for progressive die and press tool makers. Helping the designer with intelligent decisions will reduce the potential for error and greatly improve manufacturing productivity. VISI can work directly with Parasolid, IGES, CATIA v4 & v5, Pro-E, UG, STEP, Solid Works, Solid Edge, ACIS, DXF, DWG, STL and VDA files. The extensive range of translators ensures that users can work with data from almost any supplier. The ability to skip corrupt records during the import process provides a platform from where the most inconsistent data can be managed. Very large files can be handled with ease and companies working with complex designs will benefit from the ease with which their customer’s CAD data can be manipulated. VISI provides a dynamic structure from where it is possible to work with either solid, surface, wireframe or a combination of all three without any restrictions. Solid modelling has become a fundamental cornerstone of design but is often limited to prismatic or basic geometry. Solid modelling commands include boolean technology such as unite, subtract, extrude, revolve, sweep, cavity, intersect and hollow. Surfacing technology however provides a different set to tools and techniques for more organic, free-form geometry creation. Surface modelling functions include ruled, lofted, drive, sweep, n-sided patch, drape, tangent, draft, revolved and piped surfaces. These modelling commands combined with advanced surface editing make it easy to heal imported geometry or construct the most complex 3D data. VISI Progress can unfold both surface and solid models using a powerful geometry based unfolding algorithm. The developed blank is based on a Neutral Fibre model calculated by choosing one of the standard offset ratios or using an automatic neutral axis formula. Step by Step unfolding allows the designer to plan each forming stage by dynamically adjusting bend angles. It is possible to incorporate parametric features such as ribs and bosses that can be activated or deactivated as required at forming stage. Flexible editing allows the removal or addition of extra stages providing the user with complete freedom for unfolding experimentation. Starting with the developed component blank it is possible to quickly formulate a 3D strip layout. 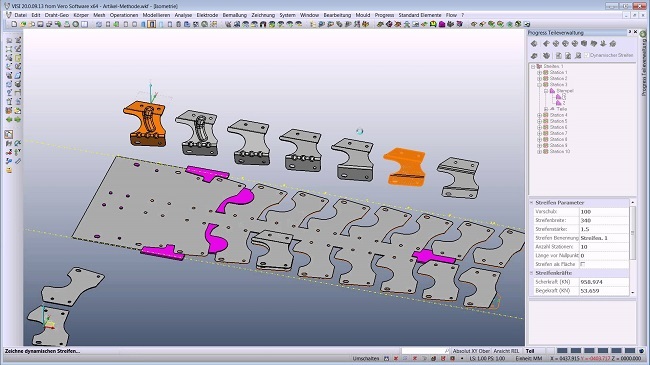 Automatic blank alignment, rotation and optimization help plan a more efficient strip. Punch design and layout becomes more effective with the use of the automatic 2D strip plan, including fold lines. A variety of automatic and semi automatic tools assist in the creation of shearing punches that once created can be dynamically moved to different stages in the strip using drag & drop. Placement of 3D folding stages into the strip is a seamless process and the strip can be easily updated to accommodate a reduction or increase in number of stages. At any point it is possible to access all the strip parameters including strip width and pitch for essential modification when required. The 3D strip can be simulated at any point to check the validity and performance of the design. The economy (material wastage) of the strip layout is automatically calculated when comparing the developed blank to the actual material used at each station within the tool. Critical forces essential for successful tool design are also provided, these include shearing force, bending force and stripping force calculations which are all computed from the 3D models and their material properties. These forces can be calculated globally for the complete tool or locally for a specific station. The tool assembly allows the designer to quickly construct a solid based layout of the required bolster plates along with the necessary pillar and bush arrangements. Access to the parameters of each individual plate ensures that modification of the tool layout is quick and efficient. The Tool Assembly will typically include all the critical data required for correct operation of the press tool, including press stroke, strip stroke, punch height and tool stroke information. Each assembly can be stored as a tooling template, or alternatively a template can be chosen from a list of common tool standards. The template can then be applied to suit another strip layout, automatically adapting the tool to the dimensions of the new strip. Part list information is also captured within the tool assembly for downstream processes such as 2D detailing and stock ordering. VISI Progress supports standard parts libraries from all leading suppliers of Progressive Die Tooling components, including Misumi, Futaba, AW Precision, Fibro, Strack, Danly, Rabourdin, Mandelli, Sideco, Intercom, Bordignon, Dadco, Dayton, Din, Kaller, Lamina, Lempco, MDL, Pedrotti Special Spring, Superior, Tipco, Uni and Victoria. The proprietary parametric component library enables both quick and accurate placement of each standard component and ensures that modifications can be made at any stage during the project. Each component has a full list of editable parameters enabling essential adjustments to suit individual tooling requirements; this includes the creation of clearance holes for each component. All components come with manufacturing data attributes and a full parts list itinerary. A fully automated approach to the creation of non standard punches for trimming and forming operations enables easy and efficient design. Automatic punch extrusion ensures all clearances are correctly designated in each plate throughout the tool assembly. Clearance parameters related to each plate type can be effectively managed by the use of templates that can be applied to any punch at any time. Parameter based creation of punch heels, support stems, and punch holders assist the rapid design and manufacture of non standard punch shapes. A complete set of 2D detailed drawings can be generated directly from the solid tool assembly. This includes fully editable 2D and isometric sections views, automatic plate dimensioning and hole type and position tables. Individual details can be created from any component in the assembly and displayed as a mixture of 3D rendered and 2D drawings. Any standard catalogue component will also have the correct detail representation within a section view. A change in the solid model will result in a modification to the 2D view along with any fully associative dimensions. Parts list table items and their respective balloon references can be added to the drawing using dedicated assembly management tools. Due to the integrated nature of VISI, manufacturing of individual plates can be completed using feature recognition. Drilled hole features and apertures are automatically selected with the correct drilling cycles and 2D milling routines applied. For more complex forms VISI Machining can be used to generate both conventional, high speed and 5 axis toolpaths. Complex punch apertures and the corresponding solid punches are easily manufactured with seamless integration to wire EDM. Keeping the model within the same product environment throughout the complete design cycle from design to manufacture will guarantee data consistency and greatly smooth the design process.